This is a Hickok belt box from the 1930's. 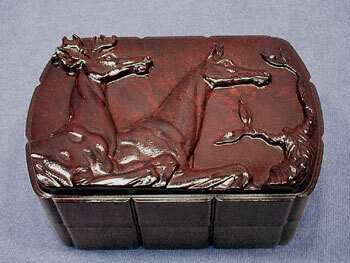 Hickok packaged their belts in decorative boxes such as this, which allowed the consumer to use it again for other purposes. Most were used to hold cigarettes, but they were also used as desk or dresser boxes. This one is 4-5/8" long, 3-1/8" deep, 2" tall, and pictures a stag and doe in sculptured bas relief. It is marked "Made in U.S.A." on the bottom, and it has the Hickok shield and name on the underside of the top. This box has no chips or cracks, and is in fantastic condition!